In western culture, the afterlife is often depicted as a place where angels rest on clouds and harps play soothing music. Here in Virginia, some people hear that music even before death. A program called Music by the Bedside is making for a peaceful passing. It’s a sunny afternoon in an old Victorian house near downtown Charlottesville, and Kate Tamarkin, conductor of the Charlottesville and University Symphony Orchestra – is using her spare time to play the harp at Hospice of the Piedmont. Tamarkin oversees the program -- scheduling seven skilled musicians to play at hospitals, nursing homes, private homes and hospice, for people at the end of life. Usually, she provides entertainment -- conducting for a large audience, but she says playing one-on-one is different – a very personal form of communication. When she senses the patient is more relaxed, she might transition to something more cheerful. Studies suggest this musical service does as much for certain conditions as powerful medications. All of this at no cost, but Tamarkin would like to have some money to assure that patients always get prompt service from properly trained musicians. "Volunteering is a beautiful thing, but I want to be able to pick up the phone and call people and to compensate them for their skill and their dedication," she said. So she’s organized a fundraising concert on November 9. Christine Wright, House Manager for Hospice of the Piedmont, is delighted. More than 600 people have passed through this house since it opened in 2004, and Wright says all of them could benefit from music. 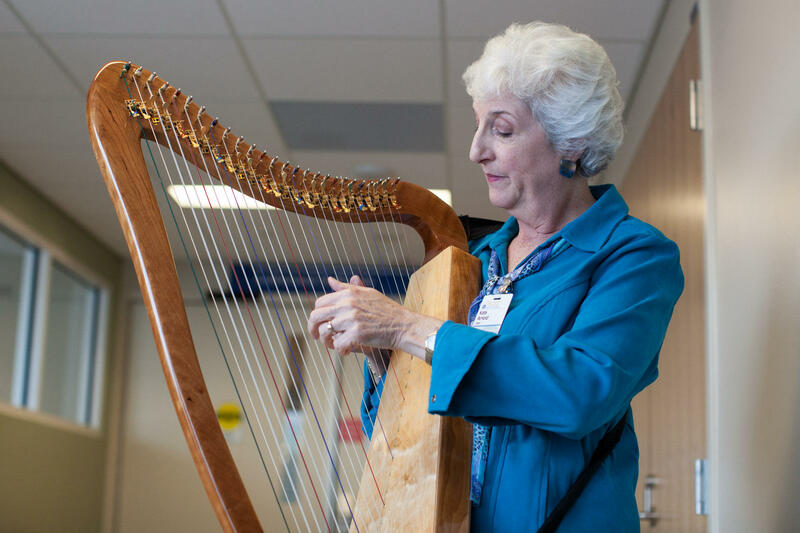 "It’s very calming, very soothing to the patients, and that’s one of the last things that they’re connected to is the sounds." Music by the Bedside has also helped grieving friends and family members. Tamarkin recalls a three-year-old girl visiting her dying grandfather. When she first saw him, unconscious and pale, she began to cry, but Tamarkin stepped in with her harp. "I played the Itsy, Bitsy Spider. The little girl was surprised. She stopped and her mother says, “Shall we sing for Grandpa?” and we went through our repertoire of the Itsy Bitsy Spider, Twinkle Twinkle and a few others, and she twirled and skipped out of the room, and he died shortly thereafter." While she’d like to pay musicians, Tamarkin notes that playing for the dying brings other rewards. This work teaches people to be in the moment, she explains, to consciously meet whatever comes our way, and we have the privilege of embracing the mystery. You will feel more alive than ever. Tamarkin and her colleagues will play for the public Saturday, November 9th at 7 in Charlottesville’s First Presbyterian Church. Saturday, October 12, those involved in the hospice movement celebrate World Hospice Day, a time to talk about comfort and quality of life in a person’s final days. Hospice is not a place—it’s not about buildings and bends, but rather attitudes and philosophies. There are about 120- licensed hospices in Virginia, providing end of life care. A California actress—but Roanoke native—is using her hometown and surrounding areas to shoot her next film, called A Good Day to Die, about end-of life planning. For more information about the October 24th End Of Life panel, or about the A Good Day to Die film project, click here.